WASHINGTON -- The number of Americans filing new claims for unemployment benefits fell more than expected last week, which could ease fears of a marked deterioration in labor market conditions after a surprise stumble in job growth in March. Initial claims for state unemployment benefits dropped 42,000 to a seasonally adjusted 346,000, the Labor Department said on Thursday, unwinding the jump in the prior week related to difficulties adjusting the data for seasonal variations. That was the largest weekly drop in jobless claims since mid-November. Jobless claims are now back at the lower end of their range for this year. Data for the week ended March 30 was revised to show 3,000 more applications than previously reported. Economists polled by Reuters had expected first-time applications to fall to 365,000 last week. Differences in the timing of Easter and school spring breaks, which likely threw off the model used to smooth the data for seasonal fluctuations, had been blamed for the spike in claims during the week ended March 30. A Labor Department analyst said no states had been estimated and there was nothing unusual in the state-level data. He noted, however, that the floating Easter holiday and spring breaks continued to pose challenges for the so-called seasonal factor. The seasonal distortions in the data will probably remain over the next few weeks. The four-week moving average for new claims, a better measure of labor market trends, increased 3,000 to 358,000. Despite the rise, the four-week average stayed close to a level economists normally associate with payroll gains of about 150,000 per month. 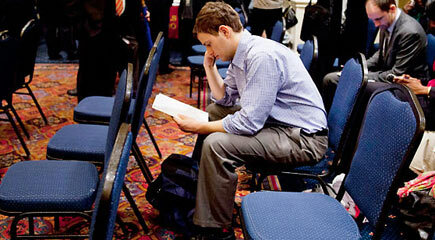 The job market suffered a setback in March, with employers hiring the fewest number of workers in nine months. However, economists say the 88,000 payrolls gain after a solid 268,000 increase in February overstates the labor market's weakness. The economy had experienced relatively strong job gains since October. The claims data is being monitored for signs of layoffs related to $85 billion in government budget cuts known as the "sequester." Economists say there is little evidence so far to suggest that the spending cuts which took hold on March 1 were hurting the labor market, noting the weakness in payroll growth last month had not been confined to sectors expected to be hard hit by the budget cuts. The Federal Reserve has tied monetary policy to the labor market. Minutes of its March 19-20 meeting released on Wednesday showed the U.S. central bank was moving closer to ending its monthly $85 billion purchases of mortgage and Treasury bonds to keep rates low and spur faster job growth. The meeting was held before the release of March's weak employment report. The claims reported showed the number of people still receiving benefits under regular state programs after an initial week of aid fell 12,000 to 3.08 million in the week ended March 30.